A black and white photograph of the Whitby Main Fire Hall located at 201 Brock Street South. 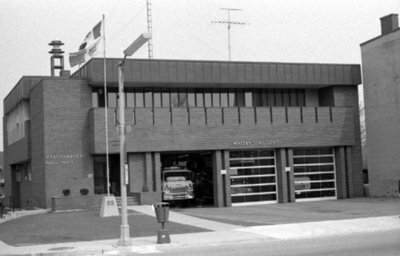 The Whitby Main Fire Hall was built in 1964/65 at the corner of Brock and Colborne Streets. It was officially opened on May 26, 1965 by Mayor Warren Mowat. 201 Brock Street South, April 1976, Brian Winter. Whitby Archives A2013_004_022A.